In addition to its culinary uses, ginger may provide multiple benefits to your health. Although it may be best known for its effects on nausea and vomiting, it possesses other medicinal properties that may be able to help with ailments such as arthritis, injuries and cancer. Before using ginger for medicinal purposes, consult your health care provider to make sure it is safe for you to use because it may interact with medications. Ginger is actually the underground root of the plant Zingiber officinale, and it has been used medicinally for more than 2,000 years. It is native to Asia but has been used in Asian, Arabic and Indian medicine to help treat various conditions, including arthritis, colic, heart conditions and diarrhea. It is also frequently used in cooking as a flavorful spice. The components of ginger root thought to have medicinal properties are the volatile oils and the phenol compounds such as gingerols and shogaols, explains the University of Maryland Medical Center, or UMMC. Ginger is often used to help treat and prevent nausea associated with chemotherapy, motion sickness and pregnancy. Study results are mixed, but this herb can help reduce nausea, although the exact mechanisms by which it does this are not known, states Drugs.com. Pregnant women who use ginger should not take it for more than four days at a time and should talk to their obstetricians before using this supplement. Post-surgery nausea and vomiting may be relieved by ginger, although some studies found an increase in vomiting after surgery when using ginger, says the UMMC. 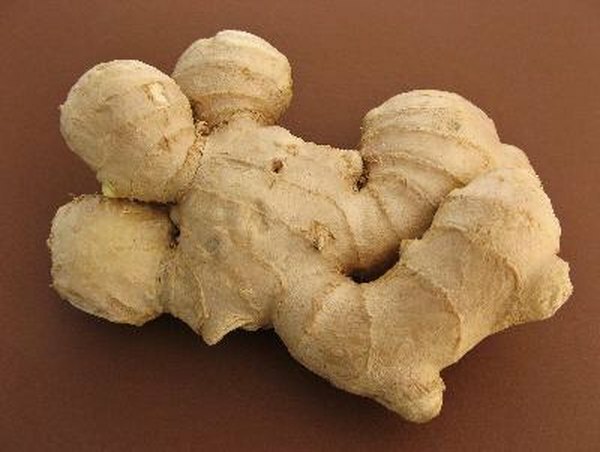 Ginger is purported to have anti-inflammatory effects and has been used to treat ailments related to inflammation, such as ulcerative colitis and arthritis, says the UMMC. In addition to its effects on inflammation, ginger may also help relieve muscle pain caused by excessive exercise. In a 2010 study published in the "Journal of Pain," by CD Black et al, daily consumption of ginger produced moderate to large reductions in muscle pain after injury. In the treatment of osteoarthritis, ginger has shown mixed results in reducing inflammation and reducing the amount of pain medication needed to relieve symptoms. More research needs to be done for definitive answers on this topic. Ginger may help to reduce the risk of platelets clumping together and causing blood clots, but study results are mixed. According to Drugs.com, some studies found ginger prevented clumping, but in other studies, no effects on platelets were seen. This herb may cause apoptosis, or cell death, in cancer cells, but no human studies have been done in this regard, just animal studies, so more research is necessary.